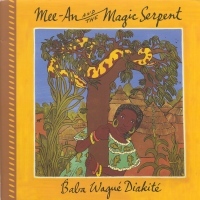 Baba Diakité was born in Bamako, Mali in West Africa. His mother gave him her father's name of "Wagué" , which means "A Man of Trust". He spent his early childhood with his grandmother in the village of Kassaro for his "first education". There, he tended his uncles' sheep and helped in his grandmother's rice and peanut fields. His free time was spent with friends in the bush; hunting, catching or watching the animals. Later Wagué moved to Bamako to be with his mother and to get formal schooling. He maintains his best education came from stories that were told him by his grandmother and mother about animals and the "First People". Wagué grew up drawing, first for his own pleasure, then for schoolwork and finally for part-time jobs. He first learned claywork however, after meeting american artist Ronna Neuenschwander, and moving to the US in 1985. There, he began using the cup and saucer as his canvas. Wagué had his first solo exhibition in 1988, and since has shown in group and solo shows throughout the US including New York, San Diego, San Francisco and Houston. 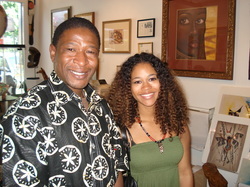 His work has received critical acclaim in Portland area publications as well as international magazines such as Ceramics Monthly, Landscape Architecture, African Arts, and AFRIQUE/Etats Unis. He has taught in the Oregon public school systems through the Art-in-Education program since 1989. He has been commissioned to create poster designs for a number of city-wide art festivals, and was honored to be chosen to create the artworks for recipients of the 1990 Governor's Arts Awards. 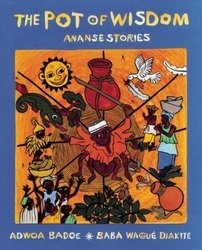 Scholastic, Inc. published Wagué's first children's book "The Hunterman and the Crocodile" in 1997. It received a Coretta Scott King Honor Book Award in 1998. 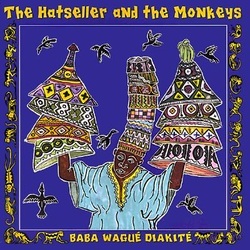 His 2nd children's book entitled "The Hatseller and the Monkeys" was published by Scholastic in 1999. 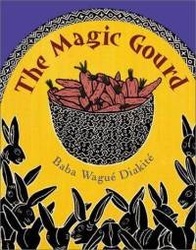 He illustrated a 3rd children's book entitled "The Pot of Wisdom," authored by Adwoe Badoe in 2001. Baba Wagué Diakité is represented by Pulliam/Deffenbaugh Gallery of Portland, Oregon. Wagué and his wife, artist Ronna Neuenschwander, have collaborated artistically on a number of projects, including an animated film, a documentary film of their lives, and a number of public art projects. Wagué has recently opened the Ko-Falen Cultural Center in Bamako, Mali, to enable artists from other countries to visit and work with artists of Mali. They continue to return to Mali with their growing family every other year for extended stays. Diakité, his wife, and their two children divide their time between two homes: Portland, Oregon, and Bamako, Mali. 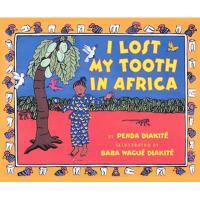 Coretta Scott King Honor author/artist Baba Wague Diakite and his daughter, Penda, create a charming, original adventure story about losing a first tooth while visiting family in Mali. More than anything, Amina wants to lose her loose tooth while visiting her family in Mali, West Africa. Only then can she put it under a gourd for the African tooth fairy, who will exchange it for two chickens! Happily this happens, and even better, the chickens lay eggs. But will the eggs hatch before it's time to return home to America? 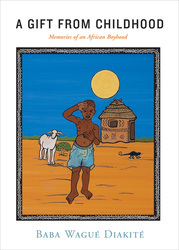 In this fresh, spontaneous story that is infused with close family warmth, Penda June Diakite joins forces with her award-winning author/artist father to give a charming peek at everyday life in Mali.